They are used to provide a variable output speed from a constant speed power source or to increase torque for a variable speed power source; standard ratios range from 5:1 up to 60:1. Gear drives are generally used for applications with heavy loads or those that need consistent performance with low maintenance. They are constructed of steel. The simplest gear drives are made with a large gear and a small gear on either side of two connected gears. Compared to belt or chain drives, gear drives are usually more expensive but have a wide range of uses including auxiliary transmissions, hydraulic drives and differentials. They are most commonly used in motor vehicles as the transmission, where they adapt the output of the engine to a rotation speed suitable for the drive wheels. Because engines operate at high rotational speeds, the transmission reduces the high speed of the engine to the slow speed of the wheels, which increases torque. Pedal bicycles also use a transmission, though it is substantially less complex. Gear drives are also widely used in material handling such as grain, rock or bulk materials as well as in conveyor systems, bottling equipment and packaging machinery. A transmission will often have more than one gear ratio and may switch among them as the input speed increases or decreases. This can be done manually or automatically. In motor vehicles, the transmission is connected to the engine’s crankshaft and the driveshaft, which is joined to one or more differentials. Gear drives used in automotive transmissions typically provide four to ten speeds, depending on the vehicle. Auxiliary transmissions are installed behind the main transmission and are used to increase the ratios when needed. Gear drives used as power takeoffs are also mounted beside the main transmission and help provide offset from normal drivelines. Marine gears are transmissions that carry power to the propeller and usually only have one speed for forward and one for reverse. Similar mechanisms include gear boxes, gear reducers and reduction gears, each working differently but to the same end. 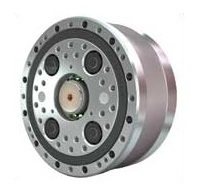 Cyclo reducers use rolling elements to reduce the input speed in a vertical or horizontal orientation while right angle gear boxes are positioned perpendicularly. Inline gear reducers can have parallel input and output shafts and are designed to be used in a line with other equipment in order to promote a smooth flow of operation. Gear Drives Gear drives are mechanisms designed to alter the speed, torque or direction of rotating shafts using gear ratios.